The limit of the maximum number of layers has been removed. However the app runs slower if you add too many layers. The display of the maximum number of layers disappeared on the Canvas Size Selection window. Now it is easy to draw a radial line. It is useful for drawing comics and illustrations. Open the ①[Tool Selection window], select the ②[Filter]. Adjust parameters such as Inner Radius, Outer Radius, Thickness, etc., and then tap the ④[✓] button. Now It is easy to draw a speed line. It is useful for drawing comics and illustrations. Adjust parameters such as Line Space, Length, Thickness, etc., and then tap the ④[✓] button. You can now adjust colors finely. Adjust the Input-to-Output graph, and then tap the ④[✓] button. Now It is easy to recolorize images and photos and change the impression of them completely. Choose a gradation from presets ("Basic"), which you can also customize yourself, and then tap the ④[✓] button. Now it is now easy to draw clouds and smoke. Adjust parameters such as Rough, Brightness, Contrast, etc., and then tap the ④[✓] button. Added new blending modes, Invert, Lighter Color and Darker. They are available in the Layer window. They will extend your power of expression. For example, let's apply the Invert blending to a layer of radial lines. Open the ① [Layer window] and select the ②[layer with radial Lines]. Tap the ③[Blending mode] and select the ④[Invert]. You can now use the Pressure Sensitivity feature on Android devices. (It is enabled when your device supports pressure sensitivity or you are using supported styluses). Please see here for supported stylus pens. 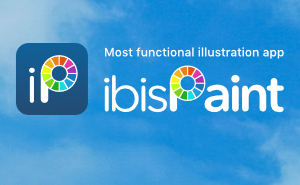 * ibisPaint for iOS (iPhone/iPad) already supports pressure sensitivity in older versions. This is a new feature for Android devices. With supported stylus pens, the thickness or opacity of lines changes reflecting the pressure. You can adjust the pressure sensitivity in the [Settings]. Open the ①[Tool Selection window] and select the ②[Settings window]. Adjust the sensitivity with the ③[Pressure Sensitivity] graph. You are now able to download over 500 fonts. Open ①[Tool Selection window] and select ②[Text]. Tap ③[Add Text] to add text to the area of your choosing. Tap ④[Font] in the Text window. Tap ⑤[Download] button you want to add. Using [Real Time], you are now able to draw more beautiful, natural curves. The default is set to [Real Time], but you can revert back to the interpolation method of previous version by selecting [After]. Tap①[Stabilizer] and select ②[Real Time]. *The default setting is set to [Real Time]. The limit to number of color pallets has been eliminated. Tap ①[Color] and then tap the ②[>] button. Drag and drop the ③[Current Color] to register it to the color pallet. It is possible to expand the character’s eyes to a larger size. Open ①[Tool Selection window] and select ②[Filter]. Adjust the Ignition Point, Expansion, and Radius, then tap the ④[✓] button. It is now supported with the multitask functions, "Split View" and "Slide Over" on the iPad. Lining up ibis Paint and your browser in "Split View" allows you to conveniently draw pictures while looking at reference pictures. When using a pressure-compatible devices or a pressure-compatible digital stylus, you are now able to finely adjust the pen pressure in a graph under [Settings]. *The pressure features become effective when using a 3D Touch-compatible iPhone 6s (and later), the Apple Pencil on the iPad Pro or Wacom’s digital stylus and so on. Open ①[Tool Selection window] and select ②[Settings]. Adjust the pressure sensitivity on the graph. You are now able to dock the "Tool Selection window" to [Left], [Right], and [Popup] positions under [Settings]. The default setting is set to [Left]. Select from ②[Left], [Right], [Popup] positions. *Default position is set to [Left]. You can now rasterize vector layers (text, frame or shape layer) or layers with screen tones. You will be able to use Brush tool, Eraser tool or Transform tool on rasterized layers. Tap ①[Layer] and ②[…], then select ③[Rasterize]. Up until now, transparent PNG images could not be saved unless the background was also transparent, but transparent PNG images can now be saved even if the background is white. 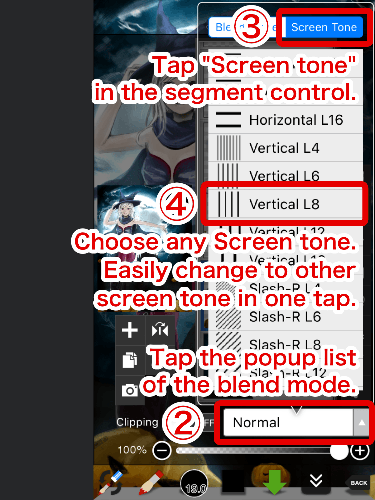 Tap ①[Layer] and ②[…] buttons in order, and select ③[Save Canvas as Transparent PNG]. It is now possible to compose all layers into one single layer. Tap ①[Layer] and ②[+], then select ③[Add Layer from Canvas]. The layer combining all layers will be added. It is convenient for filter processing such as "Stroke" and "Drop Shadow". Artificial intelligence (AI) automatically paints color when line drawings are loaded. Try a variety of line drawings! ①Tap “Layer” and then ②“Import from Photo Library” to load an image. ③Adjust the position and size of the image and then tap “Done”. ④Tap the “Tool Selection” and then ⑤“Filter” in order. Artificial intelligence paints color to line drawings. If you want to paint with a different color, select a color, put some points where you want to paint, and tap ⑦“Paint”. Artificial intelligence paints color again. Tap ⑧“Done” if you like it. You can draw rectangles easily. It is useful for a background of a character, or to create a rectangular selection area or mask. ①Tap the “Stabilizer tool” and then ②“Rectangle” in order. ③Drag your finger on the canvas and draw a rectangle. Draw more rectangles by changing the size and color. You can draw grid patterns easily. It is useful for a background. ①Tap “Tool Selection” and then ②“Filter”. Adjust color, columns, rows, and thickness, etc. as you like, and tap ④“Done”. It is a function that the place painted in white becomes transparent. In the sample, the underlying line drawing is masked by a layer painted blue. ①Tap “Layer” and then ②“Visible” button to display filled layer. Fill displayed layer with white. Tap ③“Layer” and then ④“menu in order, tap ⑤“Clear White (Color)”. The place painted white becomes transparent, and the picture below is now visible. You can move the position where to respond when you touch the canvas with your fingers: up, down, left and right. ①Tap “Tool Selection” and then ②“Settings”. ③Adjust the position where to respond your touch by arrow keys, as you like. The location responsive to touch was moved to 5px up and 5px left. The Anime Background filter creates an anime-style background with just one tap. Please try it out in a variety of landscapes. ④Tap the “Tool selector” and then ⑤“Filter” in order. ⑦Adjust Brightness, Contrast, and Saturation, then press “Done”. The loaded image will turn into an anime-style image. The Manga Background filter allows you to create a manga-style background with one tap. Please try it out in a variety of landscapes. ③Adjust the position and size of the image and then press “Done”. ④Tap “Tool selector” and then ⑤“Filter”. ⑦Adjust Contrast, Edge Darkness, and Screen Tone Size, and then press “Done”. The loaded image will turn into a manga. There are two types of channels shift: “Moving” and “Zooming”. By applying a color-shift effect to an illustration, one can obtain a slightly different image. ④Tap the “Tool selector” and ⑤“Filter” buttons. ⑦Adjust Distance and Color Order, then tap the “Done” button. The illustration now has a cool color-shift effect. The Array Ruler now offers renderable perspective. ②Select “Array Ruler” and adjust the Division X and Y. Adjust position and size, then tap ③“Lock”. An orange border will appear around the cells. The image inside the cells will be duplicated with perspective. With this tool an authentic perspective can be added to an image. The Straight Ruler, Circular Ruler, and Radial Ruler can be used together so it’s convenient when drawing backgrounds. ③Select “Two-point Perspective” then adjust number of divisions and phase. ④Press “Surface Selection” and ⑤“Surface Handle” then adjust size, direction, and position. Once the adjustments are complete, lock the ruler with the ⑥“Lock” button. The sides can be drawn in the same manner. This is convenient when drawing buildings with perspective. Added the Frame Divider Tool. 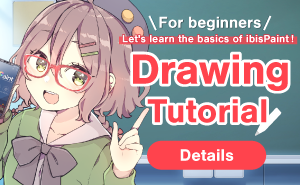 It’s now easier to draw manga! ①Tap the “Frame Divider” tool. ②Tap the screen, and then tap the “Add Frame” button. ③Adjust the margin and the width, and tap the “Done” button. ④Drag your finger across the rectangle where you want to split it into sections, and the panel will be divided. It’s now easier to draw pictures with perspective, like floor textures! ②Select “Perspective Form”, and change to your preferred shape and size. It’s now easier to draw distorted patterns, such as clothing textures! ②Select “Mesh Form”, and change to your preferred shape and size. You can now change the canvas size even after the work has been created! The canvas size will change. You can now resize the canvas and change DPI even after the work has been created! Array Ruler has been added to the ruler window! ③Set the number of horizontal and vertical divisions. ④Adjust the ruler to your preferred size, and select the cell you want to draw in. ⑥When you draw in the cell indicated, it will be replicated in the other cells. Drop Shadow has been added to the filters! ①Select the layer on which to apply the drop shadow. ④Set the radius, angle, and distance, and tap the “Done” button. Radial Line Gradation has been added to the filters! ③Set the count, phase, middle value etc., and tap the “Done” button. The gradient will be applied. Sphere Lens has been added to the filters! ③Set the height, radius, refractive index etc., and tap the “Done” button. Added "Save Canvas as Transparent PNG"
"Save Canvas as Transparent PNG" command has been added to the layer window “…” command, and you can now save images without returning to My Gallery. ④When you select “Save Canvas as Transparent PNG”, the image will come up with a transparent background. It is now possible to change the window color so that you can distinguish between the settings window and the canvas! You can choose from black or white. Added a new canvas size for print with DPI!! Added a new Alpha Lock switch in layer window!! Added a new Selection Area menu with Cut, Copy and Paste commands!! Added a new Mosaic filter!! Add text tool function (an advanced text tool with Vertical, Horizontal, Stroke, select fonts, and multiple text features). Add material tool function (880 textures and tones have been added). 6 additional (Wet Edge, Glow(Outer), Glow(Inner), Stroke(Both), Stroke(Outer), Stained glass) FX (filters) have been added. 21 new brushes (Pen (Fade), Chain, Lace, Feather, Swallowtail, Spider Net, Waterwheel, Waterwheel (Outline), Gear Wheel1, Gear Wheel1(Outline), Gear Wheel2, Gear Wheel2(Outline), Pinwheel, Pinwheel(Outline), Square, Pentagram1, Pentagram2, Pentagram3, Hexagram1, Hexagram2, Hexagram3) have been added. Added video sharing function (You can create videos without a Twitter or a Facebook account, and also select the length of the video). New feature that allows you to select an image and create a new canvas on the canvas size select screen. You can now input values using the keyboard to specify the canvas size on the canvas size select screen. New app icon and title screen design. Added a filter tool with 15 filters. "Brightness & Contrast", "Hue Saturation Lightness", "Color Balance", "Extract Drawing", "Change Drawing Color", "Mono Color", "Gray Scale", "Black & White", "Posterize", "Gaussian Blur", "Zooming Blur", "Moving Blur", "Blur Frame", "Parallel Gradation", "Concentric Gradation"
It is possible to turn the canvas rotation feature off in settings. Added a feature that allows you to share and save an image as a JPEG. 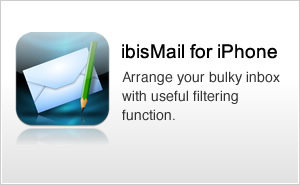 Added a feature that allows IPV files opened from other apps such as email or cloud drives to be added to My Gallery. (It can be used for backing up the IPV, restoring it, or sharing it between users. Send and receive through AirDrop. 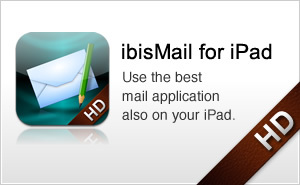 Added a feature in which you can send and receive ipv through (iOS)AirDrop. Added any canvas size slider in Canvas Size Selecting Window! Added 10 screen tones! Dot, Noise, Horizontal, Vertical, Slash-R, Slash-L, Cross, Cross-X, Square, Square-X. Added 19 new brushes! Airbrush(Perticle L), Flatbrush(Rect. ), Splash, Circle(Edge), Flare, Light 4, Light 6, Light 8, Heart, Star, Star(Round), Triangle, Triangle(Noise), Pentagon, Hexagon, Blur Circle(In), Blur Circle(Out), Blur Pentagon(In), Blue Pentagon(Out). Added the naming layer function in "..." button on Layer Window! Added the sharing function to Twitter and/or Facebook and so on as PNG, MOV, IPV(ibisPaint Vector file) on My Gallery! Added Twitter Header size and Postcard(JP) size in Canvas Size Selecting Window! Added the pressure sensitivity function by 3D Touch. * This function is available only on devices of supporting the pressure sensitivity such as iPhone 6s and iPhone 6s Plus. You can disable this function on Settings. Added the Stroke Stabilizer and Force Fading function. Added the Clipping Mask of the layer function. Added 21 new layer blend modes (Darken, Color Burn, Linear Burn, Lighten, Screen, Color Dodge, Linear Dodge, Overlay, Soft Light, Hard Light, Vivid Light, Linear Light, Pin Light, Hard Mix, Difference, Exclusion, Divide, Hue, Saturation, Color, Luminosity). Added a function that compress and save the vector file of artwork. Added a function that displays the canvas size and the file size of artwork on the Art Property screen. Added a function to the layer window that clears white areas in the layer. Added a function to the layer window that designates the selection areas by the opacity of the layer. Added a function to the layer window that save a picture of the layer to the Photo Library as the transparent png file.